A harvest of fun lessons for your young readers. Generations of young readers have delighted in rascally Peter and his misadventures in Mr. McGregor’s garden in The Tale of Peter Rabbit. 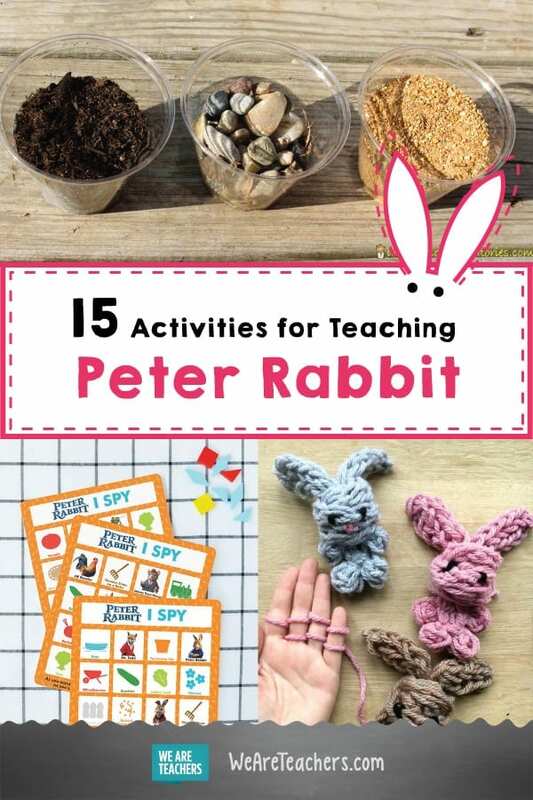 Help your students celebrate this timeless classic with these fun and engaging art, literacy, math, nutrition, and STEM Peter Rabbit activities. 1. 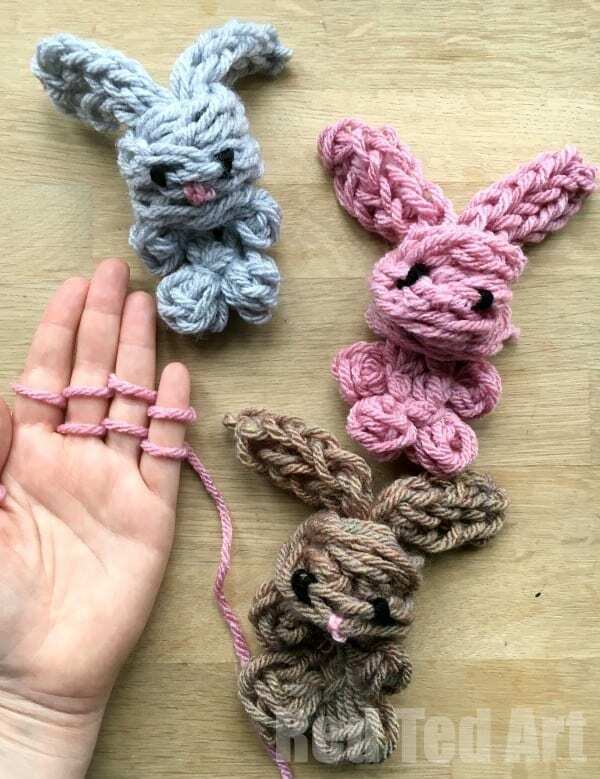 Finger knit a bunny. Finger knitting is a simple skill that, in this case, yields adorable results. Depending on your students’ age and dexterity, this can be either a together project (they knit; you assemble) or an independent project. Great for building fine motor skills, plus they get to take home a cuddly critter! 2. Experiment in the garden. Discover which environment is best for growing seedlings with this simple science activity. 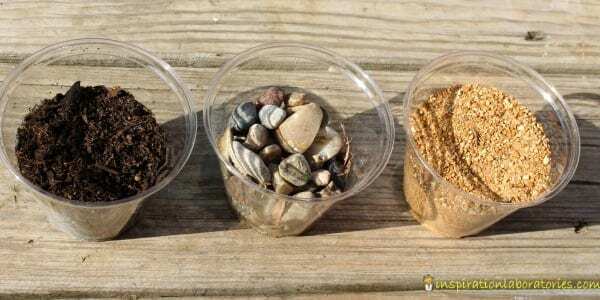 Take three identical plastic cups and fill each with a different material (soil, pebble, or sand, as seen in the image above). Then tuck a seedling into each cup. Place the three cups where they will receive ample sunlight and give each of them the same amount of water. Then observe to see which plant thrives. 3. Learn more about rabbits. Peter Rabbit and his family have been fascinating youngsters for decades. 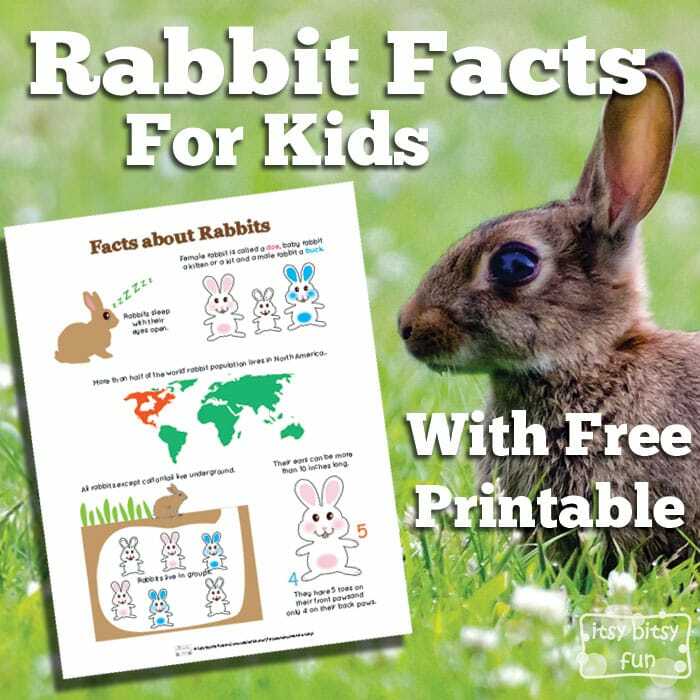 Help your students learn lots of fun facts about rabbits with this free printable poster. 4. Dig for sight words. 5. 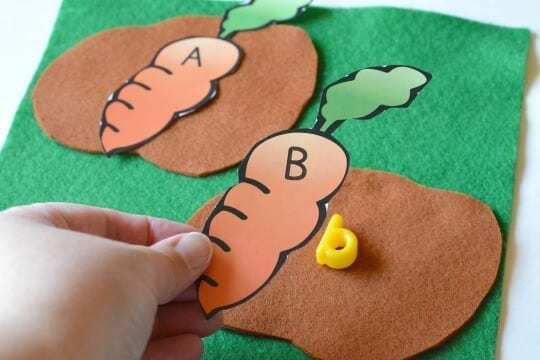 Create an ABC carrot patch. 6. Learn about cause and effect. Naughty Peter Rabbit engages in lots of mischief during his visit to Mr. McGregor’s garden. That’s what makes this a perfect story for teaching cause and effect. Create this chart with your class after you read the story. Provide your students with events from the story and have them tell you what happened as a result. 7. Build your own garden structure. 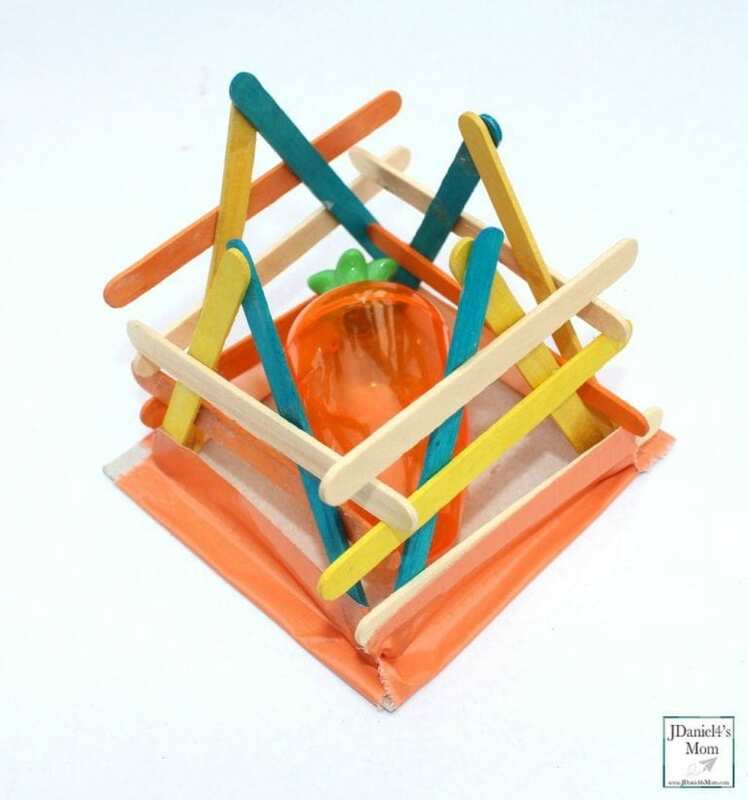 This fun design challenge guides students through each step of the STEM engineering process as they create a garden enclosure to keep Peter Rabbit from getting the giant carrot. Click here for the complete lesson and resources. 8. 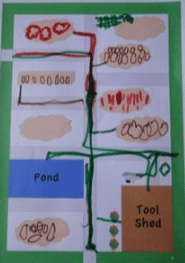 Design a map of Mr. McGregor’s garden. 9. Wrap up a healthy snack. 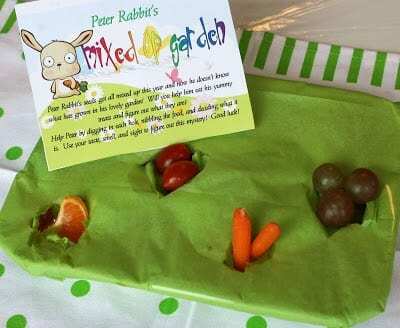 This yummy hands-on activity takes inspiration from Peter’s passion for veggies and teaches kids how to make a healthy, nutritious snack. The result is a delicious treat that Peter would definitely squeeze under the garden gate for. 10. Solve a mixed-up garden mystery. 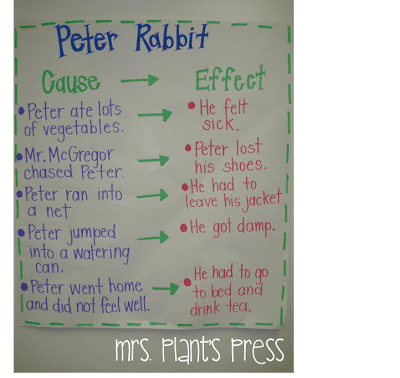 Students can help Peter Rabbit figure out what is growing in his garden by using their senses of taste, smell, and sight. This fun snack mystery is easy to prepare using a muffin tin, tissue paper, and small pieces of fruits and veggies. Click on the link to download the charming task card, seen in the image above. Young learners love to reenact stories with puppets. 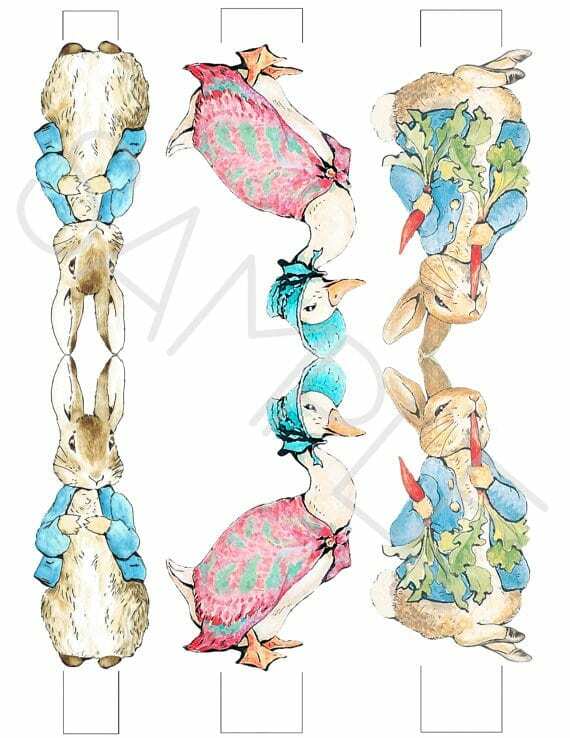 Download these gorgeous printables ($10) onto card stock and glue or tape them to large craft sticks to create a full cast of Beatrix Potter characters. 12. Put together a sensory bin. 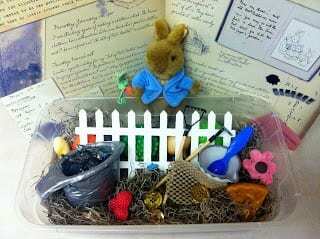 Another fun activity that encourages creative play inspired by The Tale of Peter Rabbit. For a full list of materials, click here. Be sure to tuck a copy of the book into the bin for kids to reference as they play. 13. Solve Peter Rabbit-inspired math problems. Peter’s blue jacket and its shiny brass buttons provide the inspiration for this fun math activity. Using dried beans painted with gold spray paint and blue jackets cut out of construction paper, students work through various addition and subtraction problems. 14. Try carrot number matching. 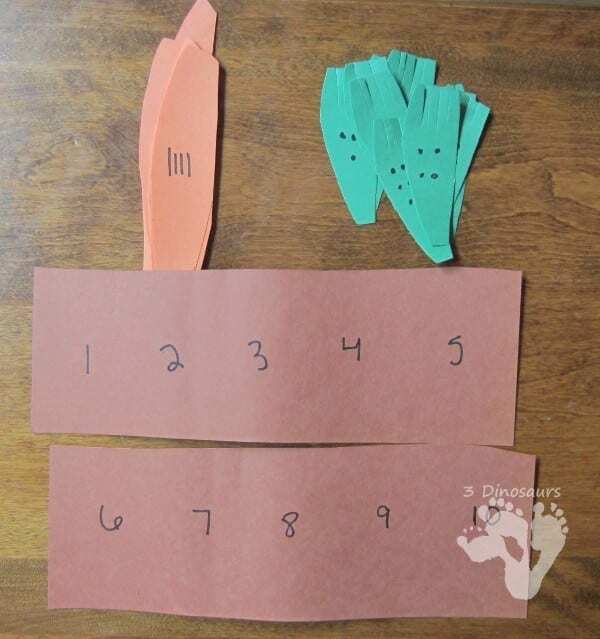 A fun and simple number-matching activity you can make with brown, orange, and green construction paper and a Sharpie. Prepare the “dirt” by writing numbers 1–10 on the brown paper. Cut out orange carrots and mark them with corresponding tally marks. Prepare green carrot tops with corresponding dots. 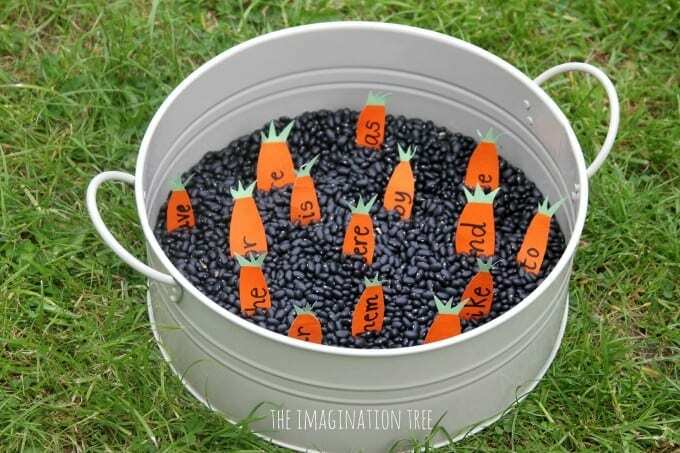 Have students put their carrots and carrot tops together and then tuck each carrot into the proper place in the garden. 15. Play I-Spy while you watch the movie. 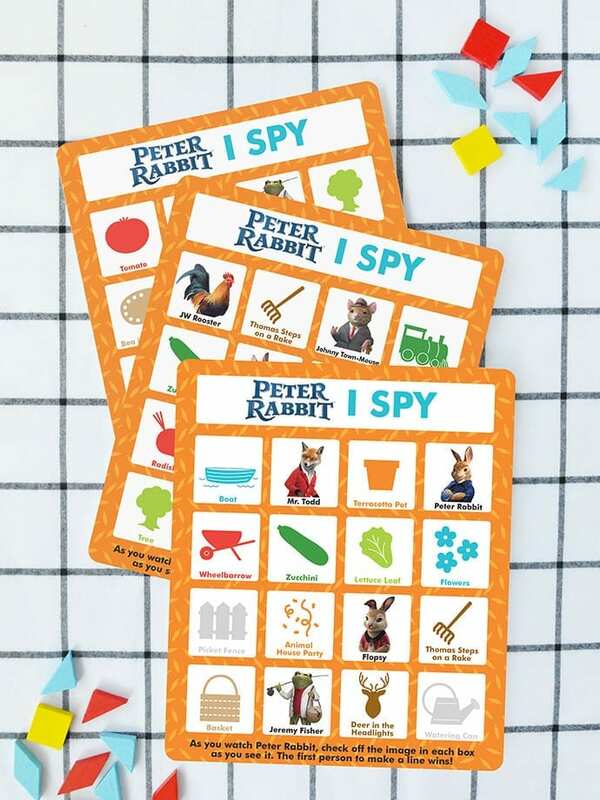 Use these free downloadable game cards to play a colorful game of I-Spy as you watch a movie-version of The Tale of Peter Rabbit. 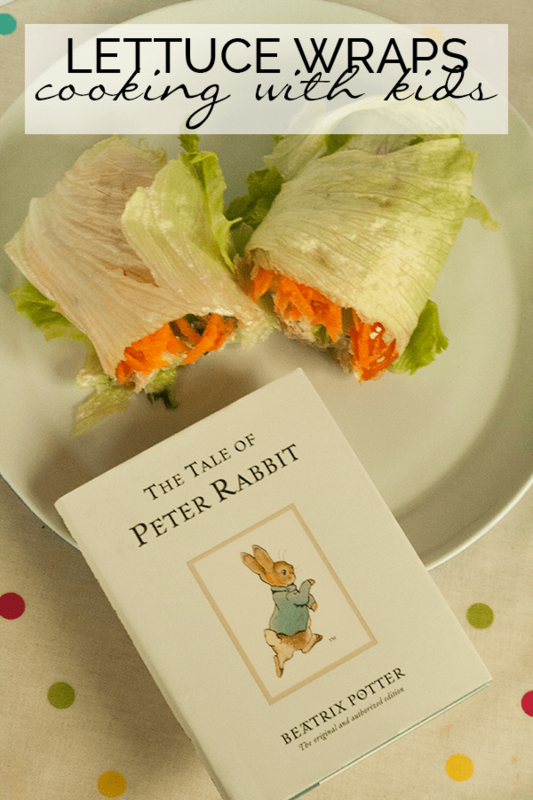 What are your favorite Peter Rabbit activities? Come share your ideas on our WeAreTeachers HELPLINE. 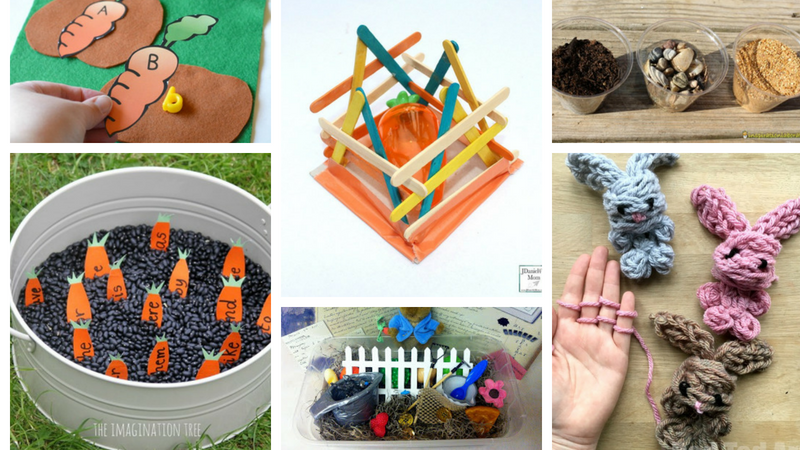 Also, check out 12 Activities for Teaching Charlotte’s Web.